Finally time to leave Bonaire for Curacao. We left early in the morning and had a nice sailing for about six to seven hours in 15-20 kn with tailwind of course. The choices we had when arriving were to go directly to Spanish Bay or to the main city, Willemstad. We went to Spanish Bay when we had info saying that we could do our clearance there. Well, we did not succeed to get any reply on the VHF except from Willemstad Port Control who said it is meant to carry out clearance in the city. Funny how info can be wrong and to be honest, we have experienced before that info given to us has been wrong. The lesson is “Always trust your own judgement”. Anyway, Willemstad is a lovely city and reminded us of Amsterdam. It was easy to do the clearance at customs as well as at immigration. We just docked with Peach nearby and it was done in lesser time than 1 hour by really nice officials who welcomed us to Curacao. It had become rather late in the afternoon why Port Control helped us to get in contact with Curacao Marine where we stayed for almost a week. We did not consider Spanish Waters when we did not like the quality of the water we saw on our quick stay the first day we arrived. 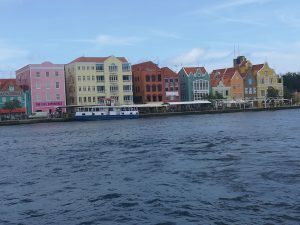 Instead, we spent several days in the beautiful city Willemstad and loved every minute. While being there we went to, among a lot of other places, Budget Marine and purchased more 12V fans. We now have on-board seven fans strategically placed. You might think it’s too much but believe me, they are needed. We decided not to visit Aruba when the fees for Peach was outrageous. No-way we were ready to pay those fees. After this very nice stay in Curacao we were eager to move on to Colombia and our final destination Cartagena, so far. We expected at least a week of sailing including some stops on the way. From friends back home as well as from pilots we had to be prepare for strong winds and large waves especially when passing the Northern tip of Colombia, Punta Gallinas. We tried to wait for a good weather forecast for at least two days period. We did not have such luck. 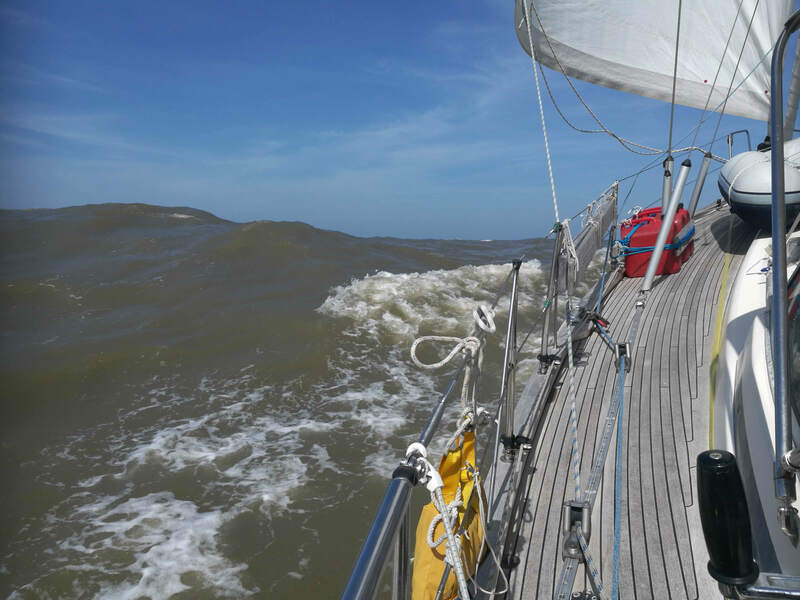 The weather was continuously changing why we took off anyway and hoped for the forecast promising decent weather during the night we planned to pass Punta Gallinas before we could anchor in Cabo de la Vela on the west side below Punta Gallinas. 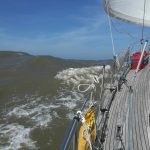 We sailed about 8 nm from the coast line and when we finally turned south, the wind and the waves came. At 10 pm we turned port towards the sheltered area, Cabo de la Vela, we though, but no, we had 35 kn during anchoring which went on all night as well as the coming day. Sand bottom and good holding why this was not a problem but annoying of course. One problem though, when we tried to bring down our foresail attached to the whisker pole! 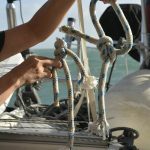 The could not be furled when the genua sheet had got stucked on the pole somehow and we had 35 kn, maybe that was the reason (!). The only solution was to use a knife which solved the problem. During the next day a couple of fishermen came along and we trade two lobsters for a knife and a potato peeler. Good business for all of us. The lobsters were really fine. Cabo de la Vela at position 12o 12.399 N 072o 09.375 W is sheltered from swell but not from strong wind coming from the North East. You may wonder why we had to cut two genua sheet. We always use two sheets when using the whisker pole. The reason is that it is very easy to set and remove the pole even in difficult weather when the tension from the sheet attached to the pole is removed by using the other sheet during the process. The idea to use two sheets when convenient was given to us by a sailing Norwegian friend, Jan, we met in Puerto Mogan. Jan was full of smart ideas! After two night rest we took off for our next waypoint, Santa Marta where we planned to anchor just south of the city before our final leg to Cartagena via Puerto Velero. We started early in the morning and arrived late in the evening. On the way we had a lot of wind and large waves. The wind at the most, about 20 nm from Punta Chengue increased to 42 kn for a while and when we passed Punta Chengue the waves just outside (5 nm) increased to between 5-7 m. We have never experienced such waves anywhere before. The autopilot could not handle this why we steered manually. Thankfully it was just for an hour before we could steer south and enter sheltered water just north of Santa Marta. 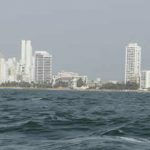 On our way to the place we planned to anchor, just south of the city, we were hailed by Santa Marta Port Control about our intentions. 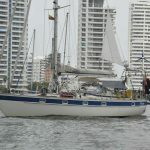 Well, to make it short, it was not allowed to anchor were we had planned and we had to get into the marina anchor place where we were allowed to stay for 24 hours before we had to leave or do the clearence in Santa Marta. We moved into the marina, which was a good one with air conditioning in the shower and toilet facilities and in all clean and well maintained marina, but expensive. They did the clearance for us without us being forced to get an agent for the job. Unfortunately, it took some time why we were stucked in the marina for a week before we could get on our way to Cartagena. river, River Magdalena, 38 nm from Santa Marta, during daytime. After heavy rain further up the river a lot of debris might end up in the Estuary including big logs which we had to look out for. We passed the river at approx. 7 nm to be on the safe side. No logs but the colour of the water was brown and the water had a strange smell. 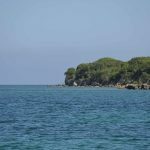 We turned south and headed for Puerto Velers for our night anchoring before Cartagena the next day. No swell but a wind of 26 kn during the night but good holding in mud. 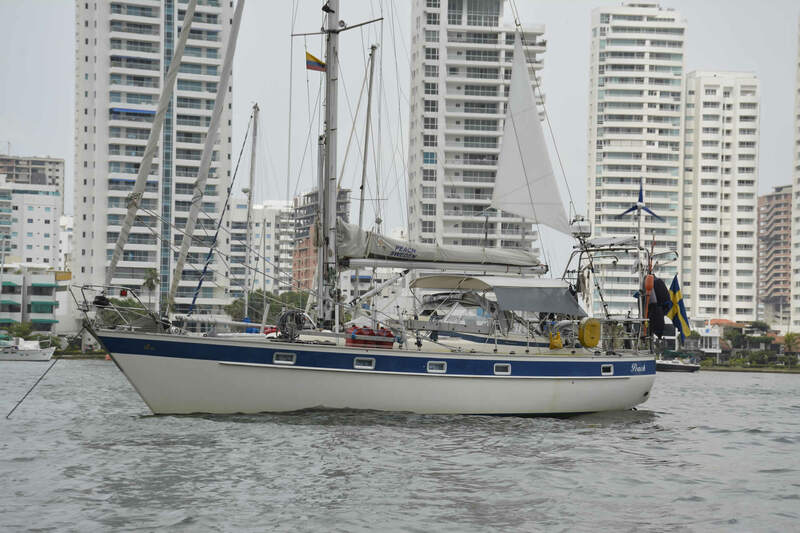 After arrival to Puerto Velero we were hailed by the coast guard who wished to come onboard for an inspection. They asked us to contact them after we had done our anchoring which we did and they came and did their paperwork as well as visual check inside Peach. Polite officials and we had a nice shat when one of them spoke excellent English. We have had some heavy wind for a number of days and hoped to reach an area where we could have some nice leasure sailing. Our wish came through the next day when we set course for Cartagena. A journey of 50 nm. Good weather and perfect wind. The closer to Cartagena we came the weaker was the wind. 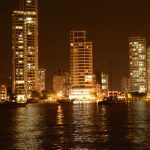 The sight of the Skyline when we got close was impressing. Not many cities that can compete with that view! 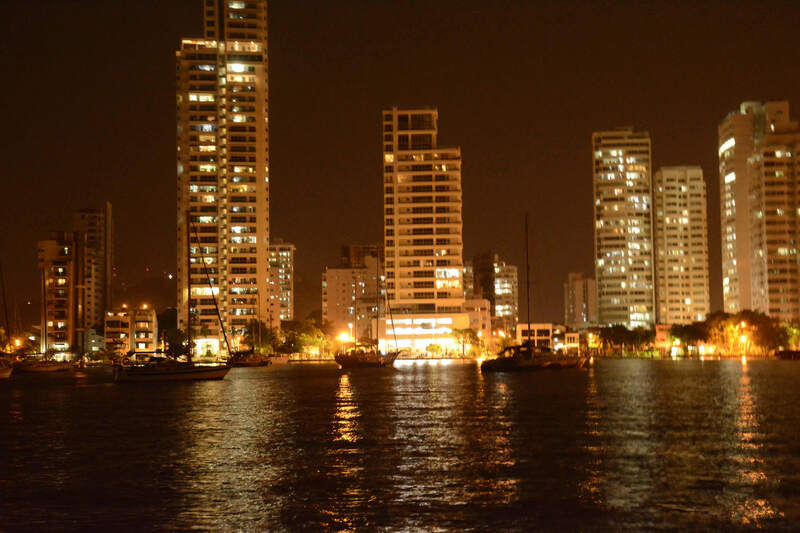 Currently we are at anchor outside Club Nautico almost in the middle of the city and are exploring the city before it is time to set course for the San Blas archipelago in Panama. 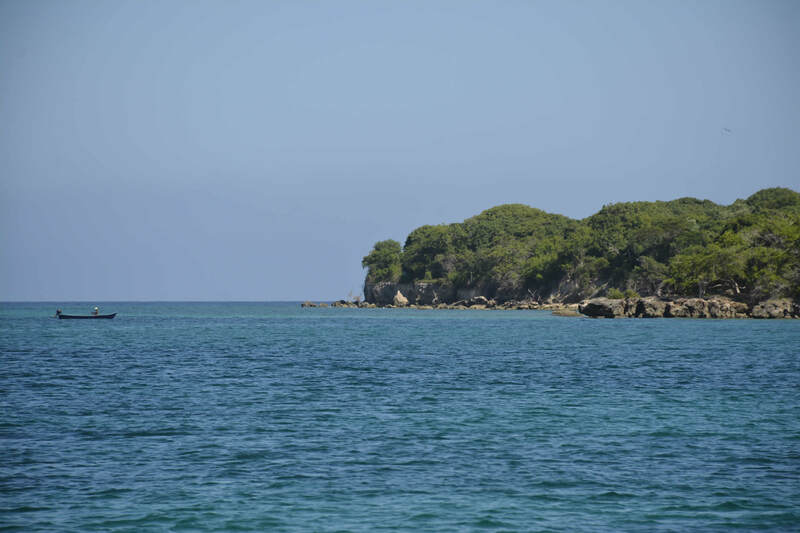 We left our anchor place once to get out and produce fresh water and at the same time stay the night in some nice bay or at Rosalio Islands. We stayed, this time at Playa Blanca in position 10o 14.529 N and 075o 36.671 W. Crystal clear water and good snorkelling. Let see where we go next time it’s time to fill our tank with fresh water. Finally, it is good to say that all our electronic equipment is working the way it is supposed!